MONTANA – For nearly two decades, the “Hate Map” project for the Alabama-based Southern Poverty Law Center has tracked hate groups across the nation, championing lawsuits that combat institutional racism and other forms of inequality, such as homophobia, white nationalism and anti-immigrant leanings. 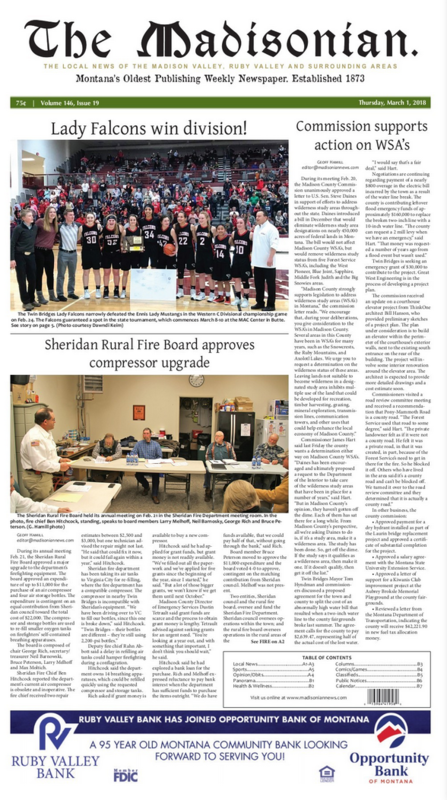 VIRGINIA CITY—At their weekly meeting on Tuesday, March 19, the Madison County commissioners approved the institution of a reimbursement fee for ranchers who legally harvest a wolf in protection of their livestock. SHERIDAN—And just like that, the old Ruby Valley Hospital building in Sheridan is gone. HELENA—Two bills before the Montana state legislature could carry significant implications for Madison County, particularly in reference to historic preservation in Virginia and Nevada cities.